Standing deadwood instead of palms, wolves instead of sea stars – Not the beaches of Lignano, Rimini or Elba, but the forest of the mid Apennine. The Italian National Park Foreste Casentinesi is located about one hour drive east of Firenze in the hilly landscape of the Apennin. It is the beginning of March and while the famous City dresses already in an early spring look, the steep shady slopes as well as the area above 1000m still show their wild side, with snow partly still more than one meter deep. Good for a group of about 20 people of all paths of life, who followed the offer of the Amici del PFNC for a wolf snowtracking weekend. Gudrun Pflüger, large carnivore specialist of the European Wilderness Society, was joining the group, learning from the local experts while sharing her own expertise. After a 2 hour Powerpoint introduction about the situation of the wolves in the park, a protected species under the EC Habitat Directive (FFH Directive), and describing methods used for monitoring their population, diet and habitat use, the group drove up the mountains to spread out in the walls of the Casa Forestale Montanino. Like wolves on a kill they gorged regional food, which bent the table. The topic during dinner was obvious: ecological questions, how wolves would shape their environment, latest sightings and also the very diverse and cultural effected history of the park. It went though logging eras (mainly Abies Alba) for building ships out of ist wood, for giving form to the world recognized dome of Firenze, for heating water for textile manufactures and later, in the first and second world war, most of the area was logged due to strategic reasons. However, some slopes are so steep, that it was always impossible to go in and log, they stayed untouched to this date. It is the Sasso Fratino with its 1,320 ha non-intervention zone, the area to be audited according to the criteria of the European Wilderness Quality Audit and Standard System. The diversity of tree species and age classes is impressive, steepness and the poor soil give reason for slow growth. But also outside the strict reserve the group had the chance – when not looking down on the ground for finding tracks – to witness standing deadwood with holes of the black woodpecker, with beetles and mushrooms. The living trees show enchanted forms and structures, covered with many species of moss- and lichen. The high diverse topography of steep slopes, valleys, ridges, low and higher elevations, north- and south exposed habitat created a diversity in habitats second to none. On the second day the group was experiencing first hand: yes, also wolves call this Park their home, tracks and feces telling the story of the about 50 wolves in the park. Opposite to most other wolf population, they mainly feeding on wild boar. 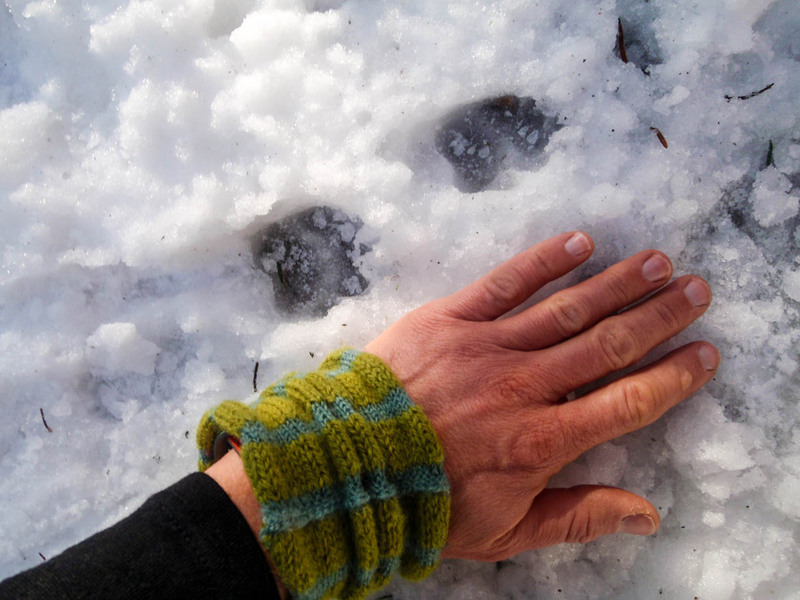 Although a must, people do not always keep their dogs on the leash when hiking in the park, so a single track of a free roaming dog can be mixed up with wolf tracks. Only following its route will distinguish wolf from dog, since their move differently through the land. National Park Foreste Casentinesi, a three dimensional landscape with multi species-multi habitat development over time which just recently received the candidate status for certified Wilderness issued by the European Wilderness Society and is now a partner in the European Wilderness Network. Italy from its best natural side. Hello – I am collaborating with world renowned super-model turned chef Maria Liberati, who makes her home for half of the year in Abruzzo. We are writing her 4th recipe book based upon her blog “The Basic Art of Italian Cooking,” and the narrative I’m using to connect each recipe is based upon an old folktale called The Wolf of Gubbio. In essence the book is also a statement of advocacy for ecological harmony and protection of canis lupus italicus. The conflict revolves around an impending “full” meant to “thin” the wolf population. I’m interested in any sort of help to make the book ecologically accurate and helpful. Maria’s blog has 500,000 followers worldwide, and therefore potential to educate many people in Italy and the US about the need for large predators in our civilization. I’m making a donation below and thank you for the brilliance of your work. I’m a retired teacher and a professional writer here to help. Please reach out, I’m a novice about Italian culture but an expert in acts of democracy and civil activism. I love wolves and would love the world more, if more wolves inhabited its forests, meadows, mountains, and plattes.